Eficode visited Chaos Communication Congress in Leipzig to get the latest look on privacy, scientific progress, computer and network security, freedom of speech and socio-political change. A couple of Eficodeans visited Leipzig Messe halls from 27 to 30 December 2017 for the 34th instance of the Chaos Communication Congress. This time the congress motto was “tuwat” (eng. “do something”). For readers unfamiliar with the event, it has been organized every year since 1984 by the German organization Chaos Computer Club. According to Wikipedia, it is the largest hacker association of Europe, with almost every major German city having its own chapter of it. The Congress is thus a gathering for all the members as well as for other visitors from around the world. Its main themes are: privacy, scientific progress, computer and network security, freedom of speech and socio-political change. Those themes are reflected in the talks that are given during the event. This year, 4 halls were set up to host curated talks simultaneously over the course of the 4 days. Most of the talks were in English, but less than a third was in German. Almost all of them were streamed and later uploaded to CCC’s own youtube alternative: media.ccc.de where they can be watched today. There is a lot to watch! Many talks are from specialists in their fields or hackers reporting results of hard work from many months. The targets were both new, like the Switch gaming console, and old like the Apollo Guidance Computer. Noticeable in this year’s schedule were also talks of government surveillance and population control. There were overviews of technologies and strategies employed by China (with social scoring), North Korea (and their private internet), Iran (blocking Instagram), Saudi Arabia, Italy, France (with anti-crypto laws), Spain (in Catalan referendum), Netherlands, Switzerland, and Great Britain (with social media manipulations). While the talks from this and previous Congresses are accessible online, taking pictures and video outside of the lecture halls is not encouraged, mostly to protect the privacy of the participants. You might want to ask “and what would be there to see?” - and the answer is “a lot”. Aside from official schedule, all participants are encouraged to organize something by themselves. Moreover, many visitors come in groups such as chapters of the Chaos Computer Club, or hackerspaces from around the world. Many of them bring computers, led strips, tools and toys. They host their own talks and workshops, that could have from a few to tens of participants. 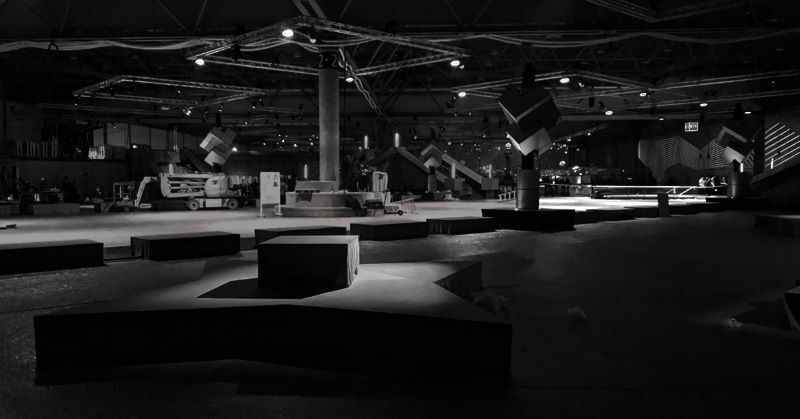 There is a lot of space for this: one of the exposition halls and two more areas, as well as space in corridors were devoted to associations, with their projects combining technology and art. “Art?” you might ask. Surprising as it may be, this technology-minded event has a lot of space for less techy stuff like interactive art and socializing. A collective incorporating art and technology arrived to the event with their various expositions. One of them was bringing old recordings of McLuhan who predicted the coming of new information age before the invention of the internet, coining the term “Global Village”. Others were incorporating sounds with physical objects. Many of those expositions were interactive, with buttons and cables to play with. Additionally, bars serving beer and mate drinks were put up around the Messe. They were all manned by volunteers, who despite paying for a ticket decided to help out. This is another important point of the event: it has a large volunteer force recruited from the participants. In exchange for working various jobs, there are 3 meals a day and a place to sleep at the event. With enough worked hours, you can get a special volunteer t-shirt, that you can wear proudly at the next event. And last, but not the least, you get to meet other volunteers who are largely a group of nice, open people. If all this piques your interest note you don’t have to come specifically to Congress to enjoy the hacker culture. There are other organizations around Europe that organize events, such as summer camps for hackers, artists, geeks, crafters, scientists, and engineers. To name a few: Electromagnetic Field in the UK, Chaos Communication Camp in Germany and Hack-Tic hacker events in the Netherlands.